Participants toured a strawberry farm, nursery, blueberry farm, winery and the Florida’s Natural citrus operation. The group also visited Gatorland, where they learned about alligator and crocodile production. Audrey Schmitz, junior in agricultural communications and journalism, saw the value in learning about agriculture in a different area. “I really liked seeing a whole different commodity than what we are used to. When you think of agriculture in Kansas, you think of row crops and cows. 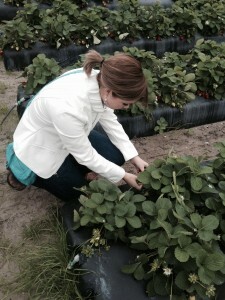 In Florida, it is strawberries and oranges,” Schmitz says. Participants interacted with professionals through presentations and breakout sessions, learning about Disney’s approach to leadership, the importance of transparency in agricultural communications, and challenges and opportunities in crop production and biotechnology. Schmitz gained valuable insight on the importance of transparent communication. “When communicating with consumers outside of agriculture, it is important to tell them what they need to know and explain why it is relevant to their lives,” Schmitz says. The University of Florida hosted the 2015 ACT Professional Development Conference. The K-State chapter hosted the 2014 conference in Manhattan. Next year, the conference will take place at Oklahoma State University. This year’s attendees included Makenzie Deines, Sadie Boline, Kenzie Curran, Amanda Sales, Brooke Harshaw, Jacob Pletcher, Audrey Schmitz, McKayla Brubaker, Keelie Curran, Sarah Harris, Briana Jacobus, Nicole Lane, Jordan Pieschl, Maggie Seiler and Dr. Jason Ellis.